Stay up-to-date on all CJR related events and stories. In medieval Japan, popular arts often took advantage of a blending of religious ideology and entertainment in order to educate, attract audiences, and solicit donations. Enter otogizōshi—a genre of short stories from the Muromachi period (1392–1573). Originating in popular performance and “picture explaining” (etoki), otogizōshi frequently delivered didactic messages through highly entertaining tales. The content of these tales varies greatly, but one subgenre that stands out is that of iruimono, or “tales of non-humans.” While many iruimono are quite humorous, there exist tales in which a plant or tree becomes human, and these stories are generally treated in a more nuanced or even tragic manner. 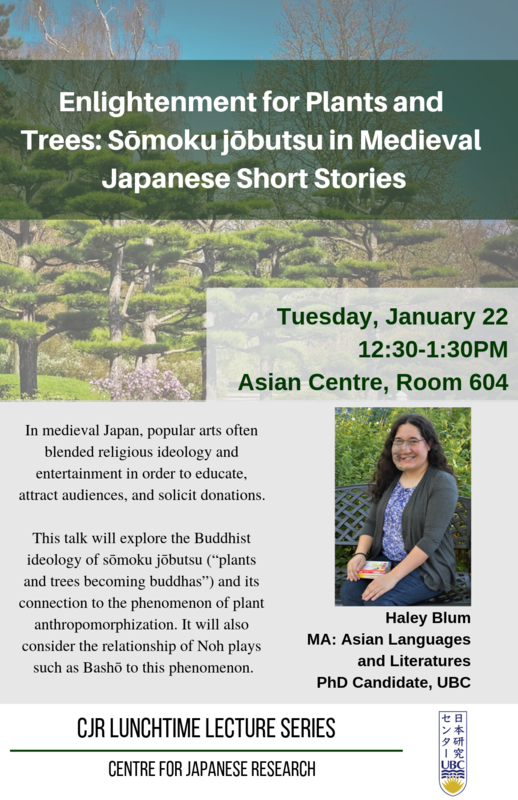 This talk will explore the Buddhist ideology of sōmoku jōbutsu (“plants and trees becoming buddhas”) and its connection to this phenomenon of plant anthropomorphization in tales such as Kazashi no himegimi (also known as Kiku no sei monogatari) and Kajō monogatari. It will also consider the relationship of Noh plays such as Bashō to this phenomenon. Haley Blum received a B. A. in East Asian Studies from Colby College in Waterville, Maine, USA, and a Master’s in Asian Languages and Literatures from the University of Massachusetts, Amherst, USA. She is now a PhD Candidate at the University of British Columbia. She recently spent a year and a half conducting dissertation research as a visiting scholar at Gakushuin Women’s College in Tokyo, Japan, on a MEXT (Monbukagakusho) government scholarship. 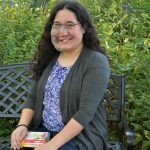 Her dissertation focus is plant anthropomorphization in medieval short stories (otogizōshi); other research interests include humor and adaptation.